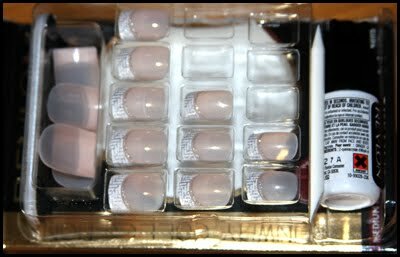 Review: Revlon Runway Collection Fake Nails in Sequins - Cherry Colors - Cosmetics Heaven! Hello, ladies! It's time to introduce you to Revlon Runway Collection fake nails! I decided to do the review in three parts. Why three? Well because my first one will be as a complete newbie, and the other two will be 'more advanced' if you know what I mean.. As I said, I'm a complete newbie when it comes to fake nails. I've tried them a couple of times, but I always ended taking them off the same hour, because they hurt too much to wear. Oh, at the time I was still biting my nails, and I wasn't used to long nails, but probably the pain was there because I've glued the nail on my skin, haha! The truth is, that I'm clumsy, so everything that includes glue is a big no-no for me. Buuuut! I decided that these nails were definitely something worth trying, and maybe something that's worth gluing your fingers together! Since my nails were layering I decided to shorten them, clean them, buff them a bit and use the fake nails. In the box, there are 24 nails, a small buffer, an orange stick and this huge glue. Yes huge, just look at the generous amount of glue they give you! I must say that I had no problem in finding the right fit for me. I guess I must be in the average group of nails. Tho I picked the thumbnails that were too wide for me. I had to take them off and apply another pair of them. Uhm, the glue is strong. It's like super glue, and by that I mean it dries instantly. I managed to glue my fingers together a couple of times, plus I glued my finger on the nail design and so on. But on the last nail I had no more problems, I guess practice does wonders? On the box, it says to press the glued nail onto the natural nail for 5 seconds and then to use the orange stick to remove the excess glue. Honestly, I have no idea what they mean by that? 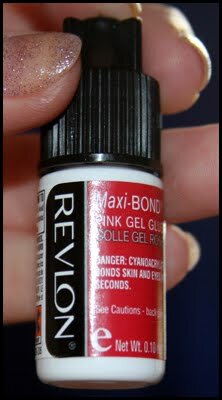 When I had excess glue around my nails (because I applied glue on my nail AND on the fake nail - a big no-no!) I managed to glue my fingers to it. I pressed onto the nails for 30 seconds, but it wasn't a firm press so I got air bubbles. But they weren't all that noticeable as you will see. Pretty no? I buffed the ends because I don't like the square shape, I could hurt myself with those as clumsy as I am! Oh, I'd almost forgot! The nails have written numbers on the other side of them (the side you can't see normally). That's really helpful but it was the only thing that made my nails look fake. Yap! If anyone would look at my nails, they'd see those small squares staring at them. Eh. How long did they last on me? Well 6 days, but I suppose they could last for at least three more. I had air bubbles under the nails, so they were weaker as they would be without them. So it happened that I lost my thumbs the first day (melted them in acetone and applied the right size of them), then the second day I managed to lost one thumb because I bumped really hard with my hand into a wall. Auch! The fourth day I lost another nail because I think I wanted to scratch something off. So ladies, now you know that you should be gentle with these nails! I mean you can do almost anything with them, just don't be harsh (as I was). I even got into a hot tub with them, stayed there for an hour and they were as good as new! Let's move to the cons and pros. + They are super pretty, the designs are exquisite. + Really comfortable, you can't even tell you are wearing fake nails! + You get 24 nails in a box and lots of glue to play with. + The price is superb compared to salons! + They are long lasting. 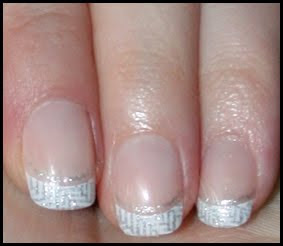 + It only requires a small amount of time, compared to a regular manicure. + They make my cuticles look perfect! - I didn't like the fact that I got so much dirt under my nails and it got stuck between my natural nail and the fake nail (not under the fake nail), it was hard to remove! - You have to be careful because these are NOT your natural nails! - They are not available everywhere, like in my country. I took them off with my teeth. Yes, with my teeth. I was bored in the car and the glue weakened a bit because I was a bit harsh on them. So I decided to try and take them off with my teeth. They went off quite nicely (remember it was day 6, after hot tubs and so on), but I still had to remove the remains of the glue with pure acetone. Girls, don't do that. Just let them melt in the acetone. Why? Well, the next day my nails really hurt. And when I say really hurt, I mean that the pain was really strong and it hurt just at the touch of anything. So do as the instructions say! I love them! I never thought that fake nails could be so pretty, comfortable and affordable! If I had to go somewhere and wanted to have my nails groomed, I'd absolutely use them! They have some gorgeous patterns, and my dear loved them (he's not really into nail polishes but he loves these!). They are easy to put on, easy to maintain and make my cuticles look perfect! Stay tuned for the next two reviews, I think it will be quite interesting as now I think I have some experience with fake nails ;). *These products were sent to me by the company or their PR.